Trixie Matkowski is warming up to running her family’s diner in the small town of Sandy Harbor in upstate New York. But the only thing more demanding than serving up piping-hot comfort food twenty-four hours a day is getting to the bottom of a double homicide…. Trixie fondly remembers summers as a child spent visiting the shores of Lake Ontario. Not much has changed—there are still vinyl booths at the Silver Bullet Diner, families eating home-cooked comfort food, and days of swimming in the lake. But before Trixie can say “Order’s up,” someone’s summer is abruptly cut short. One of the cottage residents is found dead, and Trixie suspects the crime might be linked to an unsolved disappearance in the picturesque town’s past. As Trixie works with Deputy Ty Brisco to solve both mysteries, their shocking discoveries will shake up the small town. 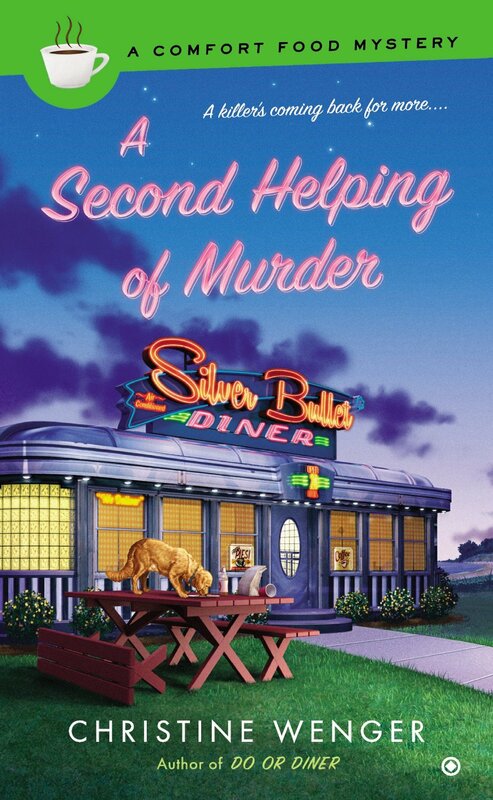 And when word gets out that she’s on the case, Trixie’s in trouble—after all, the murderer won’t spare her life just because she makes a killer corned beef sandwich…. I am so excited! I received an advance copy of this book and I quickly devoured it!!! The Silver Bullet reminds me of my own past. My family ran a local diner type restaurant and all the lingo and comfort food brings back such wonderful memories. The camaraderie of the staff rings true to everything I saw growing up. We disagreed occasionally but always had each others back no matter what. Trixie is trying so hard to make things work so she can keep up her payments to her aunt who has retired to Florida. Getting the housekeeping cabins ready for the tourist season has kept her handymen Clyde and Max quite busy. Plus she has decided to bring back the Saturday night dance tradition started by her aunt and uncle. Things are really looking up until she finds her first guest in Cabin #8 murdered. Funny, that is the same cabin a girl who disappeared 25 years ago was staying in. Wenger has plotted a fantastic mystery linking a cold case to a new one. She has also added some intriguing characters to the mix. The Van Plank family is quite an interesting group. I really like new busboy/dishwasher/computer genius Ray. I am thrilled that Trixie hired him, looking past his little hacking episode. I hope to see much more of him in the future. Deputy Ty may just be the man to make Trixie forget about Deputy Doug which puts a big smile on this reader’s face. I loved this story, awesome characters, a mystery that kept me guessing right to the end, fabulous food and a dance that featured a polka band!!! I know this is set in New York but this Wisconsin girl enjoyed this book from the first page to the last!! I think I will try that easy pulled pork recipe and impatiently wait for the next book in this wonderful series! She worked in the criminal justice field for more years than she cares to remember! It seems like she was forever going to school while working full time, but in the end, received a dual master’s degree in Probation and Parole Studies and Sociology from Fordham University. Unfortunately, the knowledge gained from way too many years in night school, didn’t prepare me for what she loves to do the most – writing romances and cozy mysteries. Sounds good to me. I will go looking. Looks right up my alley! Thanks for having that “add to Goodreads” button. Made adding the book easier! Sounds like my kind of read, with recipes too. I love the cover! .